Gr Vending provides solutions for automatic sales of parapharmaceutical products in pharmacies, adjusting its machines to their needs. The automatic sales are accomplished through one or more vending machines that are placed inside or outside the pharmacy or incorporated in the pharmacy’s showcase (like ATM bank machines), to serve the public on all days and hours. 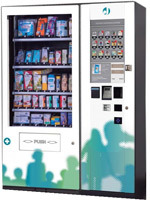 Gr Vending vending machines can offer a wide variety of parapharmaceutical products such as condoms, pregnancy tests, tampons, sanitary towels, health products, cosmetics, sunscreens, emulsions, vitamins, urine collectors etc. All vending machines come with the latest CPU technology, easy programming system and the ability to communicate with customers through easy and understandable instructions. They can provide the customers of every pharmacy a wide range of products, 24 hours a day, 7 days a week.